Pasta primavera has a lot of variations, but it is basically a pasta dish with a lot of fresh vegetables. The pasta part is obviously not suitable for someone avoiding carbs, but zucchini noodles worked out really well as replacement. 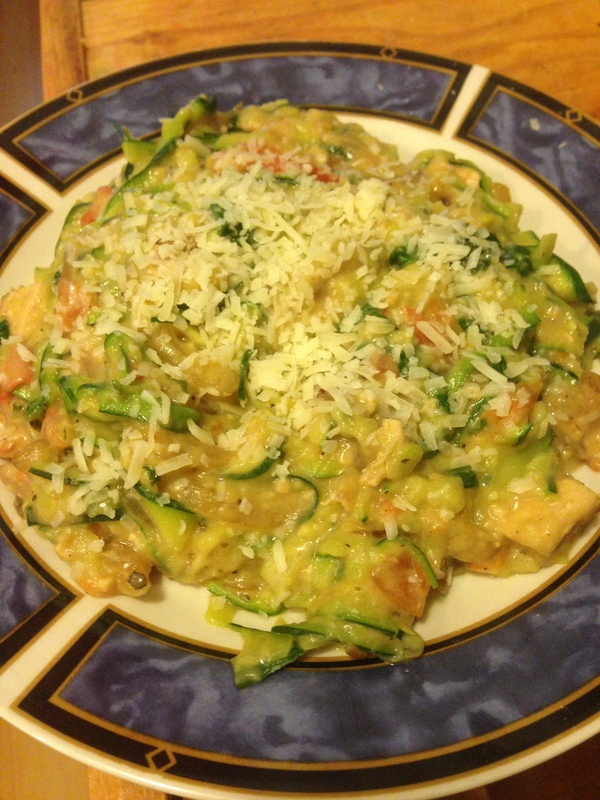 This dish also great for a meal where not everyone is following a low-carb diet, since you can make the sauce and vegetables and add some to regular pasta and the rest to your zucchini noodles. 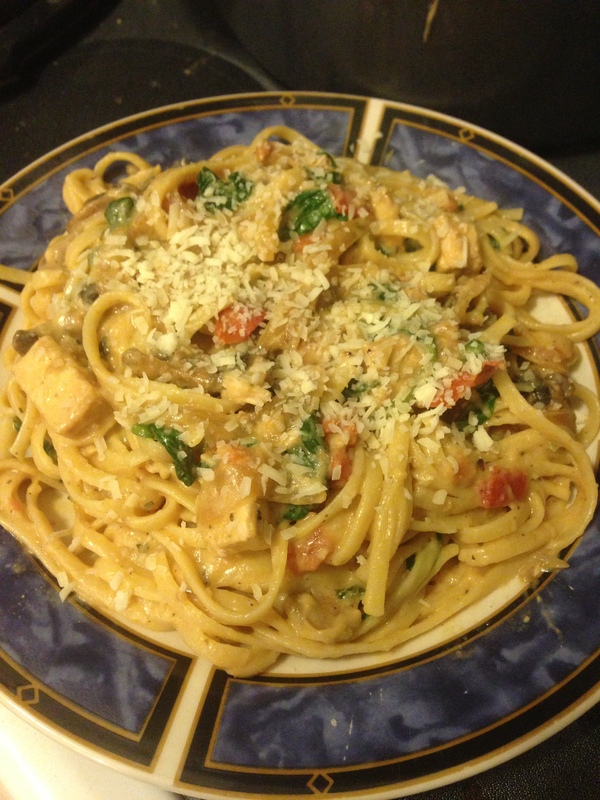 My version of pasta primavera uses onion, tomatos, mushrooms, and spinach, but feel free to add as many other vegetables as you like, such as broccoli, asparagus, cauliflower, green peppers, or snap peas. You’ll be using white sauce, the recipe for which can be found here. It can be made well ahead of time, or you can make some fresh. Cut the onion in half lengthwise, and then slice each half into thin slices. Heat the olive oil in a large pan and saute the onions until they are translucent and starting to caramelize. In the last few minutes, add the garlic and saute it with the onions. When the onions and garlic are done, add the tomatoes and mushrooms and cook until they soften. Add the spinach (which seem like too much but isn’t) and cook for a few minutes until it wilts. Add the oregano, basil, white sauce, and meat, if you choose to use it. I usually add chicken, and my daughter says it’s the best part. The white sauce contains salt and pepper, so taste the sauce and add salt and pepper as needed. This is enough to cover one recipe of zucchini noodles and 1/2 lb of linguine, which makes one large low-carb serving and 3-4 large pasta servings. If you want to use all zucchini noodles, you’ll need to use about 8 medium zucchini. Top with grated Parmesan cheese and enjoy!